The Linux /proc virtual filesystem offers a window into a running system – look inside for information on processes and kernel activity. The proc filesystem  (procfs for short), is a Linux pseudo-filesystem that provides an interface to the operating system's kernel data structures. Procfs leverages the well-known concept of "in Unix, everything is a file"  to provide the same uniform interface of Unix file I/O (e.g., open, read, write, close, etc.) for getting kernel- and OS-related information. This uniformity makes it easier for the Linux programmer or system administrator to learn about the kernel, with fewer interfaces to learn. Procfs is usually mounted at /proc. Many kinds of information about the operating system (OS) and processes running in it are exposed via pseudo-files in procfs. By reading data from /proc files, you can learn a lot of useful information about the system. This article shows some ways of getting information from procfs using custom Python programs and Linux commands. For comprehensive details about the information each pseudo-file in procfs provides, please refer to the man page for the /proc filesystem . I will focus on showing practical examples, along with a few fun shell features and tricks. Procfs is automatically mounted by the kernel at boot time under the /proc mountpoint. specifies a mount option. The values for n can be , 1, or 2, with being the most lenient, and 1 and 2 being progressively stricter modes of access with respect to security and privacy of information. Mode is the default. Many categories of files and directories reside under the /proc hierarchy. Each category serves a different purpose. Procfs provides two kinds of OS information: process-specific and non-process-specific, or general. The first three items in Table 1 are process-specific information, and the last item is an example of general OS information. In the rest of this article, I reveal the details of the kind of information each of the categories in Table 1 contains, as well as some examples of what you can do with this information. The command means: list (ls) the files matching the given file name pattern, and count the number of lines in the output (wc -l). Only the directory names (the d in -ld) are listed in long format (the l in -ld). Only files with names made up of just one or more digits ([0-9]*) are counted. hold the complete command line for the process. The components of the command line appear in this file as a sequence of strings, each terminated by a null byte (ASCII code 0, which is character \0). 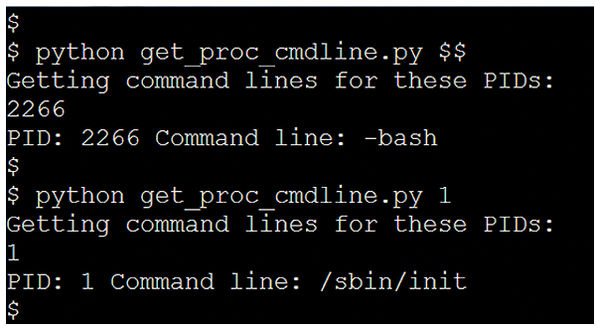 Figure 1 shows how to get the command line of a process with a Python script. The get_proc_cmdline.py script is shown in Listing 1. The script takes a PID as input and outputs the command line for the process, as referenced in the /proc/[pid]/cmdline file. As you can see in Listing 1, get_proc_cmdline.py refers to proc_info.py (Listing 2) and error_exit.py (Listing 3). Figure 1: Getting the command line of a process using a Python script. 01 # A program to get the command lines of processes, given their PIDs. 02 # in the /proc pseudo file system for various purposes. 13     Function to read the command-line of a process, given its proc_filename. 16     is True, or an error message if first item is False. 21             # Read cmdline value. 23             # Make it printable. 34     Function to read the environment of a process, given its proc_filename. 37     is True, or an error message if first item is False. 41             # Read environ value. 43             # Make it printable. 56     Function to read the status of a process, given its proc_filename. 59     is True, or an error message if first item is False. 63             # Read desired status fields and values. 71             # Get username for uid. 07 # second argument), and then exits the program. 09 # and you therefore want to print an error message and exit your program. 02 # Echoes the command-line arguments to the standard output. 12 # Sleep for 10 minutes; any reasonable time will do. 14 # and run the command to read this process's arguments via /proc. Tip: The value of the $! built-in shell variable is the PID of the last background process started, so if you are sure that the command python echo_args.py is the last background process run on this terminal, you can use $! instead of the literal value 2943 for the PID. The mysterious /proc virtual filesystem is a rich mine of information about everything in your system. The Go programming language combines type safety with manageable syntax and an extensive library. We take you through a programming example. Many Linux diagnostic tools require knowledge of a special syntax, which complicates handling and confuses the output. Sysdig groups several important tools into a single interface.